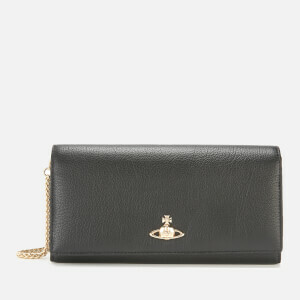 Adorned with Vivienne Westwood’s emblematic Orb appliqué on the front, the ‘Pimlico’ purse boasts a rectangular silhouette with a fold-down front secured by a snap button. 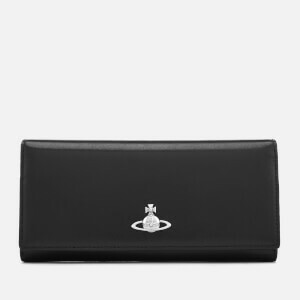 Within, the purse features 14 card slots, two slip pockets and a main compartment bisected with a central zip pocket for loose change and small valuables. Expertly crafted in Italy from crossgrain leather, the textile-lined wallet is detailed with a removable snake chain that offers versatile styling. Polished silver tone hardware and embossed branding to the internal. Arrives in a branded box. Dimensions: H: 10.5cm x W: 19.5cm x D: 3.5cm. Handle Drop: 23cm.